Yesterday I went for an overnight trip into the country with the wife. We stayed overnight at Kangaroo Valley, about 2.5 hours drive from Sydney. It’s doable in a day trip, but we figured we have some time off over the Christmas/New Year period so why not stay overnight and give ourselves time to explore at leisure, rather than rush. We drove down via Bowral and the Southern Highlands wine region, though we didn’t stop in at any wineries along the way. The weather was hot and we spent most of our activity time wandering around Bowral itself, then taking a walk through the bush at Fitzroy Falls to see this 82 metre waterfall plunging off the sandstone escarpment into the rainforest valley below. At Kangaroo Valley, we had dinner at Jing Jo Thai Restaurant – one of the few options open on the day. We ordered a garlic and ginger squid dish, and spicy stir-fried battered fish pieces. 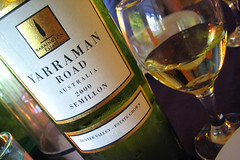 To go with this we chose this Yarraman Road 2000 Semillon. A young waiter poured glasses for us, then a minutes later the owner came out and asked if we’d tried the wine yet. He said that this was a particularly unusual Semillon, being extremely dry in style, and he’d had several diners return bottles of it, thinking it had been corked. So he wanted to check to see if we were happy with it, or if we didn’t like it he offered to replace it with something else for us. We tried sips, and thought it was okay, so we stuck with it. I can see what he meant though, as it was very dry, with a gooseberry tartness that reminded me of Sauvignon blanc, and also a hint of something earthy, slightly truffly or musty. It wasn’t unpleasant or very strong though, and the cork itself seemed perfectly fine, so we were happy to keep it. The aroma was strongly citrusy, with lime dominating over lemon, and the flavour likewise, with that gooseberry tartness on the finish. It was actually very nice with the spicy food. The earthiness was very much a background note – not something that dominated the flavour at all. Overall I’d say it was decent, and matched the excellent food well. We finished our trip by driving back a different route, taking the coastal highway via Berry and Kiama, getting home in time for New Year’s Eve! Another double wine post. 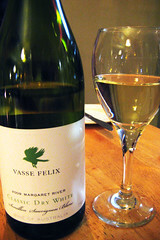 The first is a “Classic Dry White” blend from Vasse Felix in Margaret River, one of the major Western Australian vineyards. It’s a blend of Semillon and Sauvignon blanc, and tastes pretty much like it. There’s some grassy and herby tanginess from the Sauvignon blanc, tempered by the mild smoothness of the Semillon. I had it with some seafood chowder and grilled salmon. The acidity cut through the creamy chowder nicely. It wasn’t a particularly exciting wine, but not bad. 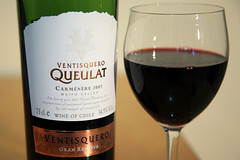 Next we have a Carménère from the Maipo Valley in Chile. This is the first time I’ve tried this grape variety and also my first Chilean wine. I wasn’t quite sure what to expect; I’d read that Carménère is similar to Merlot. But this had a character all its own. The aroma is strong and heady with the alcohol, and touches of dark fruits like plums and black cherries. In the glass it swirls thickly, coating the inside and running down in great viscous drips of deep red. It almost has a blood-like aura to it – I can easily imagine this is the sort of red wine that vampires drink. The taste is more dark fruit, thick and rich and strong. There’s a touch of spiciness and a body that the wife identified as chocolatey. And there’s a bitterness there too, but it’s not harsh like raw tannin, it’s more the bitterness of a really dark chocolate. By itself, this is overpowering, but with a spicy meat dish it worked rather well I thought. I think this could do with some time to mature, but then I don’t really know what that would do to this. It was too much for my wife, but I thought it was pretty good with some food. A triple wine post this time. Although purists would not regard the first offering as a “wine” – it’s made not from grapes, but from hot chilli peppers. That’s right, 100% chilli juice, pressed and fermented into a liqueur style drink, by Disaster Bay Chillies. I found this in a wine shop in Katoomba and the owner let me have a taste – wowee. It’s sweet and delicious, developing into a hot red chilli flavour that last and lasts and lasts. You don’t want a lot at once, but you do want more later on. I instantly bought a bottle and took it to a games night with some friends to share it around. Their opinion was mixed, with some not enjoying it, and others really liking it. I’m in the latter camp. The bottle says it lasts for months in the fridge, which is a good thing, because you don’t want more than half a shot glass at a time. But when it runs out, I’ll be buying another somewhere. 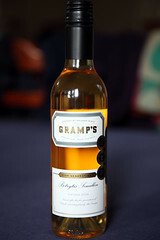 Next cab off the rank is Gramp’s botrytis semillon dessert wine. We’ve actually run out of sweet wines in our modest “cellar” (a box in the garage), so wanted to pick up something to go with cheese and crackers. This boasted some medals and wasn’t expensive, so we plumped for it. It’s thick and syrupy, and very sweet, without that hint of acidity to balance it out. The flavour is what I’ve begun to think of as typical for botrytis wines, of orange marmalade, but again without any of the subtle nuances of other flavours in there to give it complexity. M. didn’t like it much, but I thought it was passable with the cheese. 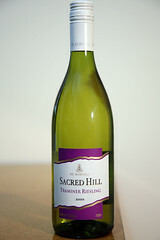 Today’s final offering is De Bortoli “Sacred Hill” 2009 Traminer Riseling, a blend of gewürztraminer and riesling to make a semi-sweet and spicy style of white wine. We found this in a bottle shop for a paltry $8.99 and I figured, “What the heck?” We had this over two nights, first with fish, then with Indian curries. I thought it was fine with both, showing the pickly spiciness of the previous gewürztraminer we tried. M. didn’t like it as much, stating it lacked the lemony citric notes that balanced the Stonecroft, and was a shade sweeter. True, it was as she described, but frankly I was hard pressed to notice the difference myself from memory. I think I’d need a side-by-side tasting to tell them apart. At any rate, I enjoyed this, and for the price I wouldn’t be shy of picking up more of this one. Another dessert wine. A few weeks ago we went on a day trip down to Berrima, a historic town on the old highway south from Sydney to Canberra and Melbourne. I remember having to drive through it on the way to Canberra many years ago and it was a nice place to stop for a morning tea of scones and cream. It’s since been bypassed and has reverted to a sleepy little village, but retains many charming features and has the usual sort of mix of antiques, crafts, art galleries, restaurants, and cafes to attract travellers and day-trippers. As we discovered on this recent trip, it also has a wine shop, specialising in wines local to the southern highlands region of New South Wales. I hadn’t even realised that this was a wine growing region! They cover a scattered area ranging from about Bowral through to Canberra. Being highlands, they are high altitude, cool climate wineries, very different from the classic Australian hot and dry climate wine regions. I don’t know much about them, but presumably they grow stuff like sauvignon blanc and pinot noir. I’ll have to look into them a bit more closely over time. 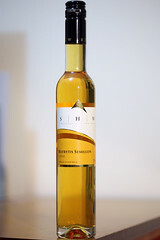 Anyway, being a sucker for dessert wines, I picked up this bottle of Southern Highland Wines 2008 Botrytis Semillon. It’s very interesting to compare it to the other botrytised wines we’ve had recently. My wife really didn’t like this one as much, whereas I didn’t see much difference at first. It has an orangey aroma and taste, leading into the slight bitterness of marmalade. I quite liked it. But a second glass brought out the differences. The previous couple of sweet wines we’ve drunk had a tingly prickle of fermentation on the tongue, whereas this one has none whatsoever. It’s a beautiful golden yellow colour, and thick and syrupy and sweet. Really not as much of that balancing marmaladey bitterness. And… simple for that. Not as complex and full of interesting flavours as the Tamburlaine Botrytis Chardonnay, nor particularly the McLeish Estate Jessica’s Botrytis Semillon. 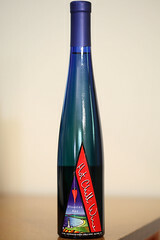 I still like it – I have a real thing for these sweet dessert wines. But I like those other two more. Last year we went away for a long weekend in the Hunter Valley. It’s one of Australia’s great wine regions, and only a couple of hour’s drive from home. One of the wineries there is McLeish Estate, which is owned by a friend’s uncle. So of course we popped in for a look around and to taste some of the wines. 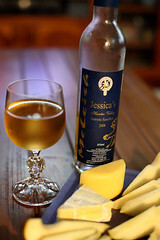 I bought a bottle of shiraz for a gift and a bottle of this – Jessica’s Botrytis Semillon dessert wine. Sweet dessert wines are one of my favourite things, even before I started this recent discovery of wine. We tasted this one at the end of our trip, after tasting a bunch of other wines – dry and sweet – and I recall being somewhat unimpressed, but perhaps it was just a jaded palate by that stage. Trying it again now, it’s a delicious syrupy wine, honey sweet with a tang of oranges and a slight prickliness of fermentation. I think I detected a hint of peach in there too. As it swirls in the mouth, a balanced bitterness of orange peel comes out – not a bad thing at all, since it nicely complements the intense beginning sweetness, toning it down. Think the elegant sophistication of dark chocolate as opposed to the simple sweetness of milk chocolate. We had it with a selection of cheeses, crackers, and sliced pear. Yum!